Salome Alexandra was Judea’s last queen. She was the wife of two of Judea’s kings. 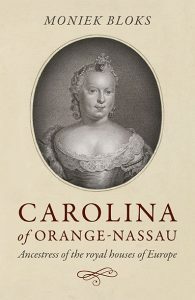 However, her second husband, Alexander Jannaeus, chose her out of all his sons to be his successor. She was a woman who is known to have brought her country peace and prosperity. While she remains largely forgotten by today’s world, she was once loved and respected by her people. Salome Alexandra’s early life is largely unknown. We know that she had Simeon ben Shetah (the future leader of the Pharisees) as her brother. She married King Aristobulus I of Judea. King Aristobulus I was known to be ruthlessly ambitious. He usurped the throne from his mother and made his mother die of starvation in prison. He also imprisoned all of his brothers except for Antigonus, “whom he loved dearly”. However, Antigonus was soon assassinated. 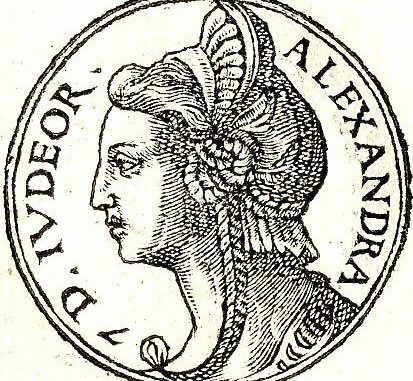 The famous Jewish historian, Josephus, first mentions Salome Alexandra as an accomplice in the assassination of Antigonus. However, most historians dismiss Josephus’s accusation because of his dislike toward the Hasmonean rulers. Historians also believe it was out of character for Salome Alexandra to be involved in the assassination. King Aristobulus I was only king for a year when he died of a perforated ulcer. Salome Alexandria’s marriage to King Aristobulus was childless. With no successor to the Judaean throne, Salome Alexandra released Aristobulus’s brothers from prison and chose his brother, Alexander Jannaeus as his king. Salome Alexandra then married him. Josephus claims that Salome Alexandra chose Alexander Jannaeus to be the king because she wanted to dominate him. She was fifteen years older than him. However, Alexander was very ambitious. He killed all the royal heirs, which solidated his throne. Alexander Jannaeus was known to be a cruel ruler. Josephus claims that he killed at least “six thousand” people. According to historian Sievers, he believed that their marriage was unhappy because he had many wives and was a heavy drinker. Alexander Jannaeus tried to persecute the Pharisees. However, Salome Alexandra opposed him. Salome Alexandra remained on good terms with the Pharisees and became well-loved among the Jewish populace. In the last three years before the end of Alexander Jannaeus’s reign, he decided to make her his co-ruler. She spent her time as co-ruler helping her husband subdue many rebellious territories. In 76 B.C. Alexander Jannaeus died. His marriage to Salome Alexandra lasted for 27 years. He chose her out of all his sons to be his successor. Thus, Salome Alexandra was sole ruler of Judea. Under her rule, Salome Alexandra maintained good relations with the Pharisees. With her permission, the Pharisees reformed the Temple ritual according to their practices, fixed the calendar, and had control of juridical leadership. Salome Alexandra also maintained good relationships with neighbouring states, and many monarchs held her in high regard. She also recruited many foreign troops which increased the size of her armies. She launched a military expedition to Damascus headed by her son, Aristobulus. However, the war proved ineffectual. She was also a skilled diplomat. When Tigranes, king of Armenia, invaded Syria, he decided to march toward Judaea. However, Salome Alexandra warded off the attack by sending him gifts. Shortly afterwards, the queen fell ill. This caused a political turmoil in Judea as her two sons fought over the throne. Hyrcanus was the high-priest and considered to be the heir to the throne. His younger brother, Aristobulus, was not content with his brother being the next king. He gathered a large mercenary army and conquered numerous forts in Judea and proclaimed himself king. Before the queen could act against him, she died in 67 B.C. This left Hyrcanus forced to submit to his brother’s will. Salome Alexandra ruled for nine years. Josephus praised her for keeping the nation at peace throughout her reign. She made many religious reforms that shaped Judea during the time of Jesus of Nazareth.She is the only woman whose name appears on the Dead Sea scrolls. She was a capable administrator and remained well-loved among the people. It is no wonder, then, why many historians regard her as “Jerusalem’s greatest queen”. Atkinson, Kenneth. Queen Salome: Jerusalem’s Warrior Monarch of the First Century B.C.E. Fred Skolnik, 2nd ed., vol. 17, Macmillan Reference USA, 2007, p. 695.